Senate Republicans have ground the body to a near-halt on nominations. With all due respect to Michael Hoza, his nomination to be US ambassador to Cameroon isn’t exactly a thrilling political development. Few people outside his professional circle likely even know who he is, and no US senators have raised substantive objections to his nomination. Nor should they—he’s a career foreign service officer with a stellar résumé, and has worked extensively in Africa. Yet Hoza has been awaiting a Senate confirmation vote since mid-January, one of 145 nominees languishing on the Senate calendar. He is waiting alongside nominees to a wide variety of offices and positions, from the associate director of the Office of Science and Technology Policy to assistant secretaries at the departments of Energy and Defense. Perhaps if these nominees were wildly controversial or had long records demanding extensive examination, the Senate would be properly exercising its constitutional duty to advise and consent on appointments. But many of these nominees are almost laughably benign, and if recent history is a guide, will eventually receive a bipartisan confirmation vote. So why are these nominees waiting so long? Routine obstruction by Republican senators who are deliberately stretching out the confirmation process for virtually every nominee to come through the Senate. And now Senate majority leader Harry Reid is threatening to once again enact rules reform that would neutralize the GOP’s slow-down tactics. Though Democrats did enact the so-called “nuclear option” eliminating filibusters on executive and judicial nominations (Supreme Court excepted), the cloture process is still in place—and it allows for as much as thirty hours of debate per nominee. 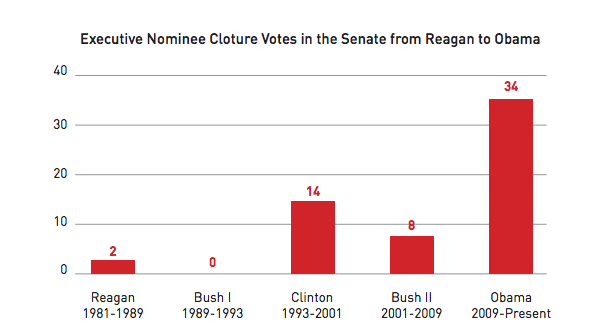 Republicans have been regularly using all of the time they can, which dramatically slows the Senate down. 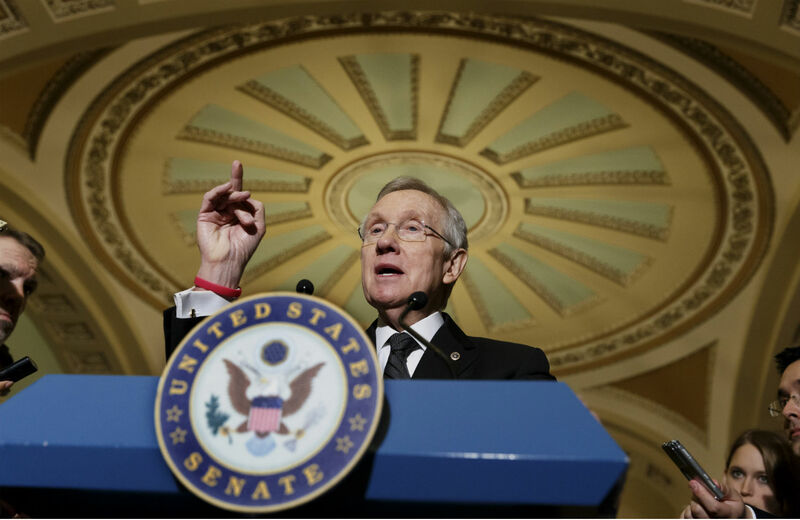 Reid has options for changing the Senate rules to combat the slow-down, which he has said wouldn’t happen until next year (and, of course, if Democrats retain the majority). One possibility is “use it or lose it” reform, which has been advocated by several good government groups, like Fix the Senate Now. Basically, senators would have to use that debate time to actually debate the nominee in question, or they would forfeit it. So if Senator John Cornyn wants to spend ten hours on the Senate floor talking about the nominee for US smbassador to the Democratic Republic of Timor-Leste (waiting nearly six months for a vote), he’s welcome to do so, but he almost surely wouldn’t. This is a particularly effective way of speeding up the Senate because Republicans can’t argue they are losing any means to exercise minority rights—they can still actually use the thirty hours on any nominee they choose. They would just have to explain why they object, which is a tall order since Republicans apparently approve of many of the nominees they are nonetheless slowing down. This obstruction is taking place largely out of the public eye—nobody particularly cares who is the assistant undersecretary to some alphabet-soup agency. But these are crucial posts in the everyday machinations of the federal government. Take Hoza, for example, awaiting confirmation to be US ambassador to Cameroon. That country has been plagued by violence from the extremist Boko Haram group for months, and has been widely criticized, including by neighboring Nigeria, for being slow to respond to the threat. Would having a US ambassador in the capital city of Yaounde have helped speed the response? We won’t ever know. Hoza has been on the Senate calendar since January 15, waiting for a vote.